KANE Is Able recently expanded its shared distribution network in three key markets to support customer growth and new business expansion. In total, KANE added 630,000 sq. ft. of additional space in Allentown, PA, Atlanta, GA and California’s Inland Empire. Near Allentown in the Lehigh Valley, KANE opened a 157,000-sq.-ft. facility in the town of Macungie, PA. The food-grade, temperature-controlled building is off Route 100 near I-78 and I-476. KANE’s Allentown campus also includes a 500,000 sq.-ft. food-grade distribution center with direct rail siding (Norfolk Southern). 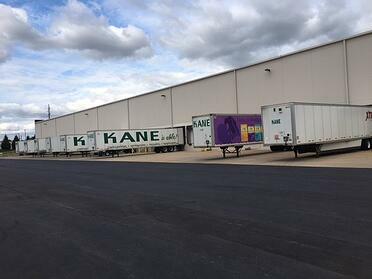 In addition, KANE is the dedicated operator of a client-owned warehouse in Allentown, giving the company a total of 850,000 sq. ft. of space in the region. In Atlanta, KANE expanded the current footprint to 450,000 sq. ft. The Atlanta location is a food-grade, multi-client distribution center minutes from all of Atlanta’s major interstates, including I-20, I-75, I-85, I-285, and GA 400. The facility has direct rail access (CSX) and is 250 miles from the Port of Savannah. The operation serves both B2B and B2C clients utilizing tier-one technology for e-commerce fulfillment. In California’s Inland Empire, KANE opened a brand new 225,000-sq.-ft. distribution center in Fontana, CA, less than one mile from the I-10 Freeway. The warehouse also has 5,000 sq. ft. of mezzanine space. The new facility will accommodate growth from both existing and new customers who are seeking an efficient solution for West Region distribution. Contact KANE to discuss how our nationwide shared warehouse network can work for you.